It appears that turn-about is fair play as John Lennon’s cheeky homage to Buddy Holly’s Crickets goes full insect jacket. 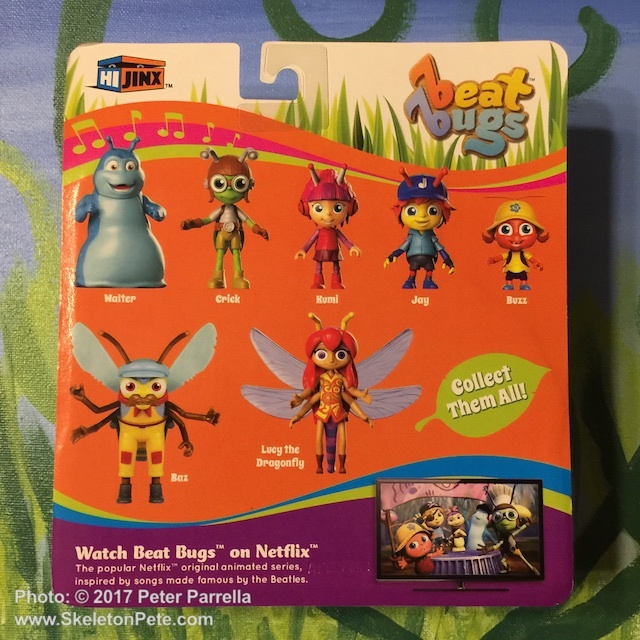 Beat Bugs features a core cartoon cast of five anthropomorphic garden critters (Walter, Crick, Humi, Jay and Buzz) adventuring all to the beat of Beatles songs. The simple story themes convey love, peace and understanding ethos as part of their life lessons. For instance the ensemble sung “Come Together” is featured in a segment that teaches the value of collaborative effort. At 24 minutes each, Beat Bugs episodes run just a couple of minutes shy of Capitol Records Meet The Beatles LP. Each show is smartly presented in two separate 12 minute stories so content can be doled out to toddlers in small bites. I’ve binge watched 5 of them so far and found them quite enjoyable. I’m 62. Of course great music doesn’t hurt the show’s appeal to parents. Moms, Dads and Grandparents won’t run screaming at a request to see the “Hey Bulldog” segment for the tenth time. I especially like the clever integration of not only Beatles songs into the scenarios but also lyrics into the characters’ dialog. How creator Josh Wakely got Sony/ATV to license rights to this “holy grail” of song publishing is a tale of perseverance. Somewhere along the line the company realized it had an evergreen catalog to flog to new generations. That’s something Disney figured out – oh – about 60 years ago. 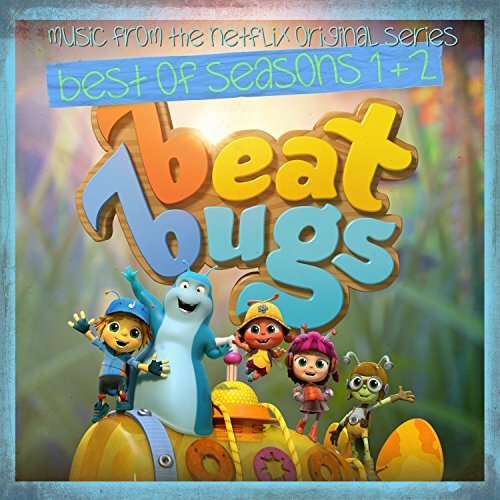 Though several of the songs on The Beat Bugs: Best of Seasons 1 & 2 Soundtrack are sung in character voices most of the characterizations are not extreme. With the exception of “Yellow Submarine” they sound surprisingly less cartoonish than the mega auto-tuned vocals associated with current pop music. BTW, the show’s incidental music is scored by the Mothersbaugh Brothers, Bob and Mark, of DEVO fame. That’s not represented on the soundtrack album, so watch the show to catch their cues. The Beat Bugs Seasons 1 & 2 Soundtrack album can be purchased or heard on Apple Music & Amazon Unlimited right now. Available merchandise includes plenty of lovable character plushes and action figures to choose from, and there are currently 26 episodes of the series to stream on Netflix. More information and activities on the Beat Bugs Website linked above. Time to get your wee ones and start singing along. 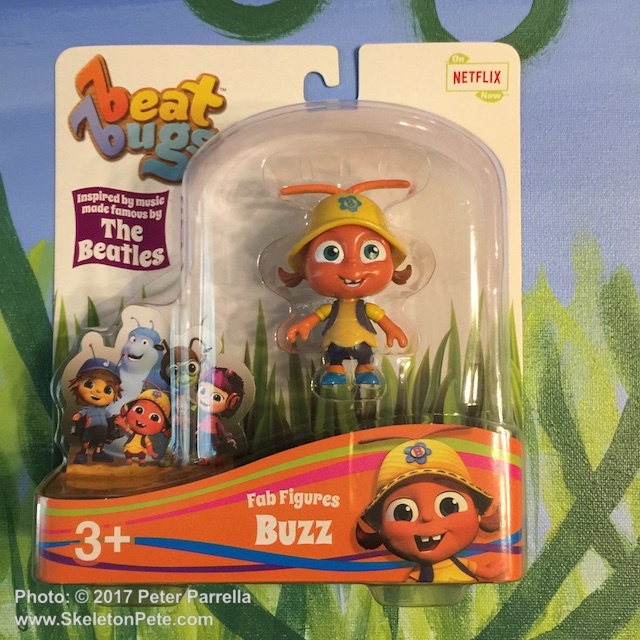 HiJinx Toys’ Fab Figures include the 5 Beat Bugs regulars and some helpful friends. Watching an iconic segment of your life morph into something that you might consider less reverent to its origins than you’re comfortable with can be a hard pill to swallow. I was about 9 years old when The Beatles hit and changed my musical life. My folks fortunately liked them. Some grown-ups of the time were less convinced of their talents. I have a vivid memory of attending a party where the birthday boy’s Dad – a concert violinist – literally blindfolded his beloved bust of Beethoven with a handkerchief and turned it to face the wall when we began spinning out Beatles 45rpm’s. It’s true. For those Fabs Fans bugged by the thought of their Beatles being co-opted for kiddie fare that ship has long ago sailed. In fact, an honest assessment would have to conclude that the Yellow Submarine movie, a cartoon, bests both The Beatles’ own shambolic Magical Mystery Tour and Let It Be films for value as entertainment. “Baby Boomers” like myself should also remember that many – if not most – of us were first exposed to classical music via popular media. We thrilled to Rossini’s “William Tell Overture” not at the opera house but as the theme to “The Lone Ranger” TV series, and our first experience with Wagner’s Ring Cycle was probably accompanied by Bugs Bunny’s portrayal of Brunhilde. Would we have been introduced to these overtures, arias, and oratorios at such a young age otherwise? Not likely. Did it hurt later appreciation of the form. Not mine. Now a new generation will get an early earful of the Fab Four and savvy parents will hopefully bolster the experience with playlists that include the original tracks. 50 odd years later it’s clear that Beatles songs, like the melodies of Beethoven, Mozart, Liszt, and Brahms, aren’t going away anytime soon. A new generation of youngsters deserves exposure to this wonderful music, by whatever means works.